What’s the key to a successful kid’s birthday party? The memories, after all is said and done. Make sure your child’s next birthday party is a special one by holding it at one of Maryland great venues. Here are the 10 best places for a kid’s birthday party in the state! With five locations in Maryland, Pump It Up is one of the most convenient places to have a birthday party. Pump It Up is an inflatable indoor playground. Birthday packages come with an inflatable birthday throne, food, drinks, and goody bags. For the most imaginative children, the Be with Me Playseum in Bethesda, Maryland, could be a perfect fit. The Playseum offers four unique packages, which includes admission, cupcake decorating, and playtime. Ahoy matey! For your next birthday adventure, why not consider venturing out onto the seven seas? And if your child isn’t quite that ambitious, you can always consider Pirate Adventures in Annapolis, Maryland. Birthday party packages include time on a pirate ship on the Annapolis harbor. Does your child have a lot of energy? For your next birthday party, consider Kiddie Crusoe. The facility has over 12,000 feet of playground, including a castle fort, pirate ship, rock wall, inflatable bounce house, and more. Check online for their most recent party packages. Climb Zone in Laurel, Maryland, offers themed climbing experiences. For example, children can choose to climb up the Empire State Building, a T-Rex, or Jack’s giant beanstalk. Birthday party packages are available. 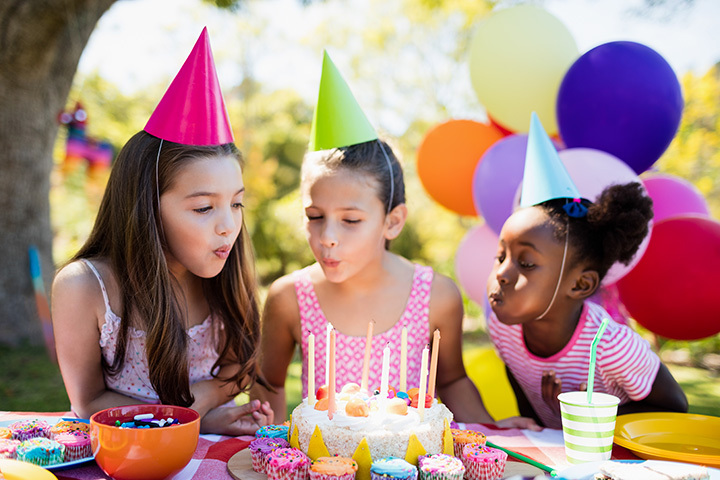 Kidville, with locations in Bethesda and Rockville, Maryland, was one of Parents magazine’s “10 Best Birthday Party Places.” Party packages include exclusive access to the Kidville Party Space, a theme, birthday cake, candles, gym time, decorations, and much more. Any time you go to Monkey Joe’s, you’re in for a party. Might as well make it official with your next birthday celebration. Monkey Joe’s has bounces, slides, arcade games, concessions, and much more. For a small additional charge, party packages can include pizza, balloons, goodie bags, and ice cream. Find Monkey Joe’s in Germantown and Hagerstown. Rolly Pollies is an award-winning kids’ gym with locations in Crofton and Severna Park, Maryland. Kids love to moon bounce, climb the rock wall, zip along the zip line, eat pizza, and more. Ask about their art program, too. Adventure Park USA in Monrovia, Maryland, boasts that it is “Maryland’s largest family entertainment center.” Activities include Go Karts, roller coasters, mini golf, laser tag, and more. Check their websites for current offers, including unlimited access to attractions and pizza. Red Zone Adventures in and Timonium, Maryland, is one of the coolest laser tag places in the state. Their Laser Maze Challenge is particularly exciting. Party-goers will enjoy the lightspace play floor, arcade games, and more.